On January 9th Amazon announced a new database service called Amazon DocumentDB that they described as a “fast, scalable, highly available, and fully managed document database service that supports MongoDB workloads”. Is Amazon DocumentDB a real MongoDB? Cluster volume: cluster has exactly one cluster volume, which can store up to 64 TB of data. - Primary instance: supports read and write operations and performs all data modifications to the cluster volume. Each Amazon DocumentDB cluster has one primary instance. - Replica instance: supports only read operations. An Amazon DocumentDB cluster can have up to 15 replicas in addition to the primary instance. If the primary instance fails, an Amazon DocumentDB replica is promoted to the primary instance. There is a brief interruption during which read and write requests made to the primary instance fail with an exception. Amazon estimates this interruption is less than 120 seconds. You can customise the order in which replicas are promoted to the primary instance after a failure by assigning each replica a priority, note that it is strongly suggested that replicas should be of the same instance class as the primary. It is also really important to create at least one or more Amazon DocumentDB replicas in two or more different Availability Zones, in this way your datastore can survive a zone failure. 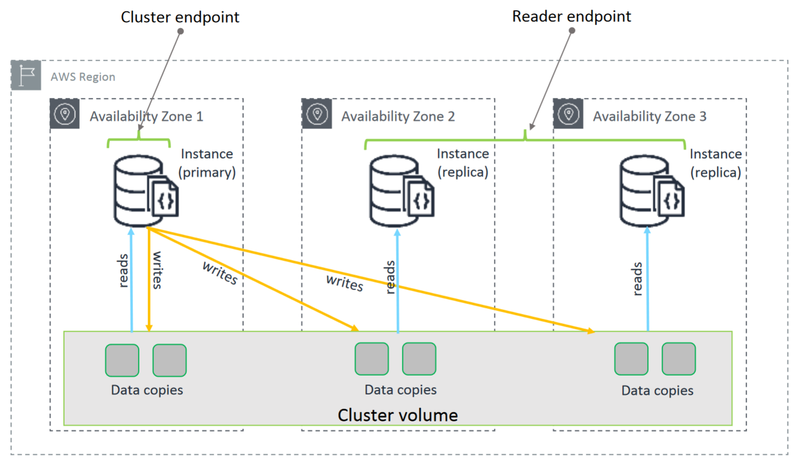 By placing replica instances in separate Availability Zones, it is possible to scale reads and increase cluster availability. Compute and storage scale independently. It is possible to scale reads by deploying additional replicas. Scalability and storage are scalable up-to 64TB. DocumentDB automatically adds 10GB whenever it reaches capacity. DocumentDB is also able to automatically fail over to a read replica in the event of a failure–typically in less than 30 seconds. Currently Amazon DocumentDB doesn’t support any kind of multi-region setup. Amazon DocumentDB does not rely on replicating data to multiple instances to achieve durability, data is durable whether it contains a single instance or 15 instances. All writes are processed by the primary instance that executes a durable write to the cluster volume. It then replicates the state of that write (not the data) to each active replica. Writes to an Amazon DocumentDB cluster are atomic within a single document. It is possible to create an AWS DocumentDB cluster using CloudFormation stack (as described here). However, they come from 2 different database families and are made for different purposes. DocumentDB is a document store while ElasticSearch is a search engine. Indexing — ElasticSearch uses Apache Lucene for indexing while MongoDB indexes are based on traditional B+ Tree. Real-time indexing and searching power of ElasticSearch comes from Lucene, which allows creation of indexes on every field of a document by default. In MongoDB, we have to define the index, which improves query performance, but affects write operations. Writing — ElasticSearch is slower on adding new data. In ElasticSearch indexing semantics are defined on client side. Indexing cannot be optimised as well as with DocumentDB. In practice, ElasticSearch is often used together with NoSQL and SQL databases. A datastore is used as persistent storage and source of truth, and ElasticSearch is used for doing complex search queries. Another key consideration while evaluating DocumentDB vs ElasticSearch is the effort/complexity associated with an ElasticSearch domains definition, sizing and maintenance. It is not so straightforward to do it (in fact it is hard to correctly size storage, shards and instance size). AWS provides some good guidelines, but it is more complex than working with DocumentDB which doesn’t require these considerations. Currently in Hotels.com we use many different datastores/search engines, so it is good to summarise our advice on when Amazon DocumentDB is or is not a good option. Amazon DocumentDB is a good solution when you need to store unstructured data that doesn’t require too many indexes or complex search features. A good benefit is that you don’t need to care too much about queries upfront. This is particularly useful when you are not the owner/producer of the data you are storing, so you don’t need to adapt your schema to a possible new data structure (like you must do with a SQL database like Amazon Aurora) and you can query data also using new fields (thing that you cannot easily do using another NoSQL solution like Amazon DynamoDB, where your data schema is based on your queries). It is also a good solution when you don’t need rich indexing capabilities and complex/fast search support (ranked results, full text search with partial matching without using regex, complex geospatial queries with inclusion/exclusion). For these kind of scenarios Amazon ElasticSearch is a better choice. Public blog for the Hotels.com Technology team.